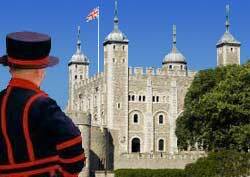 The Tower of London is a striking castle, has an intriguing history, and houses the Crown Jewels of Great Britain. The Tower of London is home to the Crown Jewels of Great Britain. The collection includes the sovereign crown and a scepter adorned with an immense diamond. Armory and weaponry from olden days are also on display.